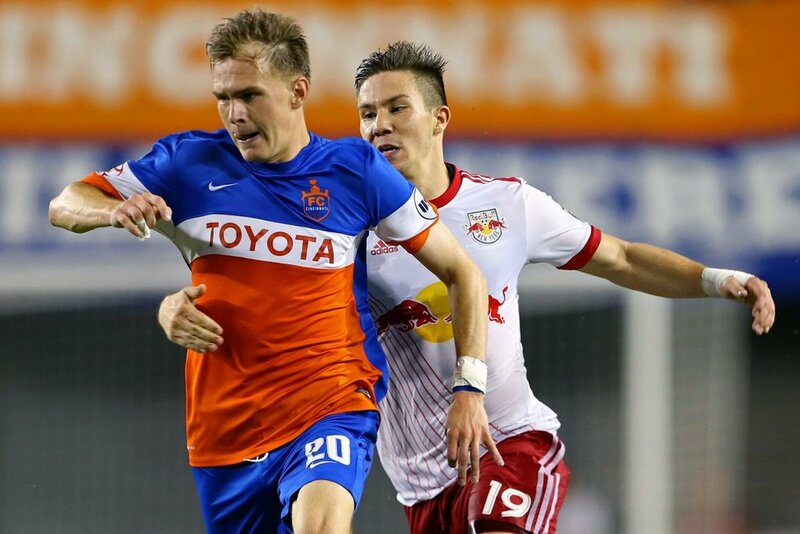 If you’re a fan of FC Cincinnati, you’ve probably had a debate amongst friends about which players you think would make the jump from USL to the MLS squad. And I am here to put those discussions to bed, tuck them in, tell them a bedtime story, and check the closet for monsters. This here is your definitive, completely uncontroversial, absolutely correct, guide to who makes the jump, and who ends up getting USL Championship MVP on Louisville City’s roster next year. Without further Freddy Adu, here is the current table of FCC players. Those above the line are, in my estimation, getting the call to join MLS. Those below may very well end up on an MLS roster, just not Cincinnati’s. Imagine for a moment Tyler Gibson scoring the game winner for New England against us next year. Now please stop thinking those thoughts. Running down the list of who makes the cut, Fenando Adi is very obviously going to be in the MLS team. While his effort for the USL side has been a little wanting, go back and watch his “performance” against Louisville, he still makes the cut. But what a message it would send to everyone if the team dumped Adi due to a lack of effort. That’s not going to happen, so our first DP makes the cut. Ledesma is playing like he is the USL MVP and playing like a man demanding an MLS roster spot. He’s been the best player in FC Cincinnati’s history, probably, and has earned a spot in the top flight. While he is a little older, his shots from outside the 18 will be deadly in any league. If anyone has “earned” a spot on the MLS roster, it’s this guy. In fact, he probably should have been on one the last few years if he hadn’t decided to be a cosmonaut. Nazmi at number three is where I could see some people taking issue. Naz is a fantastic talent, he has all the skills and necessary components of a more-than-serviceable midfielder in MLS. That’s why Chicago Fire wanted him after all. I believe that on a team surrounded by MLS talent, Naz will shine. Also, he’s one of the few players on a multi-year contract, so I suspect the Front Office wants him there too. Forrest Lasso and Paddy Barrett both make the jump for me. They are both young, have been statistically stellar in USL, and have plenty of upside. Barrett having been the captain for much of the year shows how much Koch trusts him to command a back-line. Lasso was being looked at by FC Dallas before signing with Cincinnati, and has all the physical tools to be a good-enough MLS center back. There is also something to be said for consistency in the back-line as the team moves up to MLS, and having that familiarity with each other and the system Koch employs moves them up the list. Corben Bone at number 6 is a somewhat emotional pick. It feels like years ago we were asking for Bone’s benching so Naz could start, but in the last two months Bone has been the better player on the field. He’s someone with MLS experience and a top candidate for someone who has played their way into the MLS team. Not to mention he’s the best of the remaining original three, and if you want to keep that history, and I think we would like to see at least one player from the 2016 squad make the jump, Bone is your guy. I am not saying he starts every single game next year, but he’s in the team for sure. Then we get to the goalkeepers. There isn’t much between these two right now, Newton and Richey have been brilliant and have shipped goals, but they both make the jump. Now with this list, I’m not too concerned about international spots and the other MLS tomfoolery when it comes to roster creation, but in terms of play on the field and between the sticks, these two both make it. Maybe neither one starts, maybe they both compete against someone like a David Bingham, but they have earned their spot on an MLS roster, hopefully that’s a roster based in Cincinnati. Fatai Alashe makes the jump because he is a young, proven MLS talent that took a risk coming to Cincinnati to play in the lower division to get out from a crappy team in San Jose. And when a player is willing to put in the work to improve their spot, you reward that. Also, the team told us he’s going to MLS so it’s obvious he’s on this list. How many season tickets are cancelled if he doesn’t join the MLS team? All of them? Finally, the controversial one if there is one on this uncontroversial list, Jimmy McLaughlin. Jimmy is the fan favorite. He’s the guy. At this point, he’s probably the most recognizable player on the team. And when you have a player with such a deep connection with this city, you bring him along. On top of that, McLaughlin’s play has been above average over the last month, and with a solid playoff performance, he could easily be an uncontroversial pick. Along with Bone, there is something about bringing an player from that original 2016 squad to MLS. Even if he sits on the bench and only plays in Open Cup games next year, Jimmy is on the MLS roster. Book it. So what about the players who fall just short? Well this list is fluid! There are still two regular season games to be played and, oh yeah, all the playoffs. There are a few more players on this team that could make the jump with great performances over the next month, so here’s what to look for. 10 players make the cut? More? Less? Pa Konate hasn’t been doing much for the USL side, and given how we have seen other players fall out of Koch’s good graces, Konate seems to have done that here. He’s on loan from Italy, but I suspect he gets recalled and FCC doesn’t try to fight it. Blake Smith could play into the MLS squad with a good playoff performance. For me, he is very up or down and game to game. A serious run of form could convince Alan and Luke to keep him around to at least fight for a spot next year. Keinan is the one that bums me out the most. I think Keinan could have played in MLS this year. I think he might be too old next year. The faster pace of MLS will require more mobile center-backs and that is covered with Lasso and Barrett. I’d love to be wrong on this one, but I don’t think he makes the jump. The next two on the list are ones that could easily play into the MLS team. Tyler Gibson and Emery Welshman have been fantastic when we have seen them, but we haven’t seen them all that often. Both of them are on the bubble and of the two I’d like to see Welshman get a chance to prove himself in the playoffs this year. So that’s the list. Disagree? Think I am an idiot? Drop a comment and tell me how wrong I am. I’ll try to update this as the playoffs go so we can all come back here later and get mad all over again. Where would Fabian Johnson have been on this list?